Advertising Tins: Antique auto oil SINCLAIR 2 gal. Emerald Oil; HUBERDS oil tin; GULF PRIDE marathon oil tin; INDIAN HEAD brake fluid tin; TEXACO oil tin; TEXACO outboard oil tin; SANKA 1 lb coffee tin. “Drink Coca-Cola” red & white galvanized cooler 17” x 13”; Coca-Cola iced beverage vending cooler, painted, Marked W-11S; RED BULL energy drink cooler on wheels; Oak 4 dr. CLARKS spool cabinet w/hardware 22” x 15”; MCCORMICK DEERING cream separating tin; 2 JOE CAMEL 23.5” tall advertising ash cans; wooden 7-UP, COKE & PEPSI bottle crates; metal wire antique gal. milk crate w/4 glass jugs; wooden ½ barrel; fowl crate; bucket of Indian rocks; antique iron & glass globe lightening rod; galvanized antique minnow bucket (2 pc); approx. 15 fishing rods; 2 antique wooden golf clubs; misc archery accessories & arrows; ping pong paddles & balls; NEW BADGER compound bow; Safety auto trash container; top hat; 6 ERTLE J.D. toy tractors in boxes; Metal FORD 100 pickup (aqua) w/white plastic camper top toy; M&M baseball candy dispenser; McDonalds Walt Disney toys; MATCHBOX PEPSI semi in box; MARX battery operated US Apollo Project metal space ship toy; THERMOS metal lunch box w/planets & astronauts; hopping wind-up chick toy w/box; Box of children’s toys: Power Rangers, dinosaurs, robots, cars; pair of antique MERCURY wooden snow skis; steel & wood 68” long steerable snow sled; Antique Oak dbl drawer 1 door jelly cupboard; mahogany desk; Poplar cupboard w/1 drawer dbl. door, 6 star punched tin panes & 3 shelves; 5 antique Oak harp back dining chairs; pair arrow back plank bottom Oak dining chairs; wooden antique 4 legged milking stool; painted wooden wine bottle shape liquor cabinet 34” tall w/2 shelves; framed and matted print “Sugaring Off” by Grandma Moses; 2 Box Office posters of Michael Jackson, Wimbly Stadium July 1988 printed in England 58” x 39.5” (one damaged); painted 3 shelf dbl. dr. 39” x 16” x 45” jelly cupboard; antique Oak bakers table w/2 top drawers & 2 bottom ‘possum belly drawers; primitive 1 dr. turned leg table; bamboo loose cushion sofa & side chair 50’s era patio furniture; 2 wicker rockers-1 antique w/metal label; EASTLAKE style Walnut gossip bench; bevel edge antique 37” mirror; Oak painted green 1 drawer cabinet w/bottom pie safe; antique cane bottom arm chair; 2 gal. & 4 gal. stone jugs; 25 lb. grass scale; 33.3 LP records; 3 antique Coca-Cola ad trays; COKE memorabilia; NICE old PABST ON TAP mirror w/gold trim with stemmed beer glass & PBR Blue logo 20” w x 20” h; blue pottery coin bank Teddy bear w/gold ribbons; drum bank; antique wood handle mechanical ice cream scoop; baby Browning camera; cardboard cylinder photograph container; quart Sugar Dairy milk bottle, WCH, Ohio; carbolic acid bottle w/paper label; brown JK Necht & Son Brewery beer bottle; Borden’s Chillicothe Ohio 7 oz. clear bottle; old tin SOHIO PreMix bank; 2 face Hon Kong Knickerbockers doll; LF&C aluminum US military early 1900’s mess kit; N&W Railroad iron heart shape padlock; 5 Longaberger baskets; steel cage rolling bingo game w/wood balls. 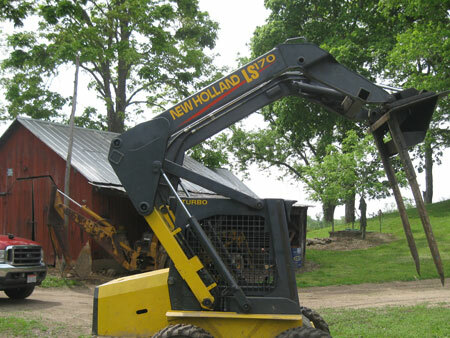 Tractor, Skid Steer, Truck, Equipment & Tools: JD 4020 wide front end gas tractor w/aux.’s & JD 148 front end loader; New Holland LS 170 Loader /6’ material bucket, 4279 hrs m/l, new tires & rims, all new filters & fluids; 1989 IH S-1654 LP Flatbed 7.3 diesel, under 26K GVW, miles: 217,920, air ride rear; Set of heavy bale forks for skid steer; Concrete Tools; WHEELHORSE 310 Model 8 garden tractor w/KOHLER gas motor, 2 extra wheels & tires; electric HD lrg. Number branding iron; single tree horse hanes; antique farm equipment manuals:; FORD, ALLIS CHALMERS, JD ranging from 1930’s-1960’s; iron tractor seat; antique EAGLE corn jobber (excellent shape); 4 gal. backpack sprayer; 1966 & 1962 Ohio farm license plates; Peter Wright, England, antique iron anvil 25” long x 10.5” tall; 15 gal ATV sprayer w/pump in box; 12” DeWalt miter saw; Drimel drill; DeWalt 90: angle cordless 14 volt drill & case; 3/8 electric drill; DeWalt drywall drill; jig saw; sander; HD Milwaukee 7 ¼ circular saw & case; 2 nailers & cases; Craftsman reciprocating saw; pop rivet kit; belt sander; hole saws; 8’ & 6’ fiberglass step ladders; Craftsman rolling tool case w/base & 2 stack units (total 16 drawers); shop vac; lawn & garden tools; Lincoln AC bus box welder; Smith acetylene torch outfit on cart; 3 HP 10” Craftsman table saw; Craftsman 5.5 HP horizontal portable air compressor; Concrete Tools; LINCOLN S.A. Welder powered by F-173 Continental engine D.C.; BOSCH spline hammer drill 11382 EVS w/approx. 7 bits; 2-concrete blades 12” /14” diamond; 2-4” x 10’ metal forms; Chapin cure spryer (new, unused); 4’ bull floats w/hustler head; Approx. 15 lbs of lead weights for bull float or Fresno; 7 clip handles; 7 screw handles; Wide range of hand floats, trowels, edgers, brick trowels, sponge floats, jointers, darbys (wood, mag). Antique acid wash peach blow hanging lamp; FIREKING Amberglow; Mossy Rose china; Depression Glass; Pattern glass. Household: ZERO Halliburton Coppertone aluminum luggage (assorted sizes); exercise bench; silver plate flatware; Emerson wire cage 4 blade variable spd. Oscillating fan (antique); red GE plastic w/chrome body Model 613 tube radio; chiming wind-up WESCLOCK alarm clock; cookbooks; SILVER SEAL set: 5 containers w/lids & manual; Alum. SILVER SEAL grill/griddle; HOLBART commercial potato peeler on wheels; wooden & iron handle large copper tea kettle; LF & C stainless steel turkey/fish deep fryer; coffee maker & waffle maker; nice 18 cubic ft. refrig. Freezer; wooden kitchen table; 6 bentwood spindle back chairs; color TV; Yamaha portable grand keyboard DGX-230 w/stand & bench plus bag; LF & C meat grinder; LF& C Universal juice squeezer; Oak queen size bed (complete). Sport & Hunting: Aerial Assault auto trap thrower dolly mounted w/ battery; 13 cases of clay sporting trap targets; filet & hunting knives; 10 pt. TITAN compound cross bow w/red dot scope; scissors & sheers; JA Henckels carving set in case (fork & knife). Pocket Knives & Straight Razors: 11- J.A. Henckels; US Military CASE dagger 6-German eyeball. 3-Remington; 1-Winchester; 1-Keen Kutter; 1-Case 5 DOT; 5-BUCK; 1-Fighting Rooster; 1-Hen & Rooster; 1-Bull Brand; 2-Kissing Crane; 1-Circle Remington letter opener w/blade; 2-Purina; 3-LF & C WWI & WWII; 24-Misc. Pocket knives. Straight Razors: 7-Double Duck; 5-Case; 2-Winchester; 8-Misc; 9-JA Hinckels Town Works; 9-Keen Kutter. Personal Property Terms: Cash or check w/photo ID; payment in full day of sale prior to removal; everything sold as-is; no warranties or guarantees given, expressed or implied; no out of state gun buyers; gun transfer paperwork filled out but not called, in-all weapons owned by Greg Snyder. All information provided is to be utilized only as a guide. Buyers are responsible to conduct any inspection, inquiry, investigations and due diligence regarding to property. Any announcements made only by the auctioneer from the podium during the time of auction will take precedence over any previously printed material and/or any other oral statements made or implied. No liability exists regarding the information contained in any printed matter for its accuracy, errors or omissions. Bidding is open, just call out, raise your hand or watch the ring personnel…they will assist you and try to get answers to any questions you may have prior to bidding. The Auctioneer has arranged the merchandise for the auction and directs that it not be altered, moved or disturbed in any way by any person other than normal inspection at the spot where the merchandise is located. 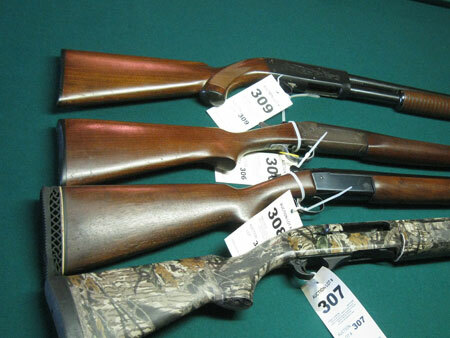 The auction staff will assist anyone who has a question or request about a lot or item. In the event any person other than a member of the auction staff is detected altering, moving or otherwise disturbing any merchandise, that person will be required to immediately leave the auction, not return and, at the discretion of the auctioneer may be barred from future auctions. Any instance of theft or vandalism will be prosecuted to the fullest extent of the law. Statute of Limitations: Any action or suit of any kind must be commenced within one year from the date when the cause of action or suit occurred or it will be forever barred. The Right of Action or suit will begin to run on the date of breach, damage or injury is sustained & not when the resulting cost, damage, harm or loss is discovered. This Agreement will be exclusively construed & governed in accordance with the laws of the State of Ohio, without regard to its conflict of Laws Principles. The exclusive jurisdiction & venue for any controversy or claim between the parties shall be the State of Ohio, County of Ross, City of Chillicothe, by binding arbitration. Taxes & Legal: As agents for Greg Snyder, POA, we will sell the following along with additions from Dave Corcoran & Stanley Stables.